Since I was just talking about rainy day fashion, here are some cute, limited edition Wellies for you! i love the biker-inspired look, with the studded straps! Buy at Akira for $225. I don't know about you guys, but when it's rainy out I have a lot of trouble trying to look nice. Luckily for me, I have a secret weapon: patent red rain boots! Every time I wear these someone compliments me, I love it! I bought them from Banana Republic forever ago, you can definitely see the wear & tear... Any thoughts on how I can make them last as long as possible? I'm also wearing some basic knit pants from Free People, a Vena Cava top, a Silence + Noise blazer, and my purple leopard print scarf from LOFT. Here's a close up of my Vena Cava top, I love it so much! It's interesting and unusual without being in your face or gimmicky. Don't forget a cute umbrella! I remember this one was super cheap at Urban Outfitters! 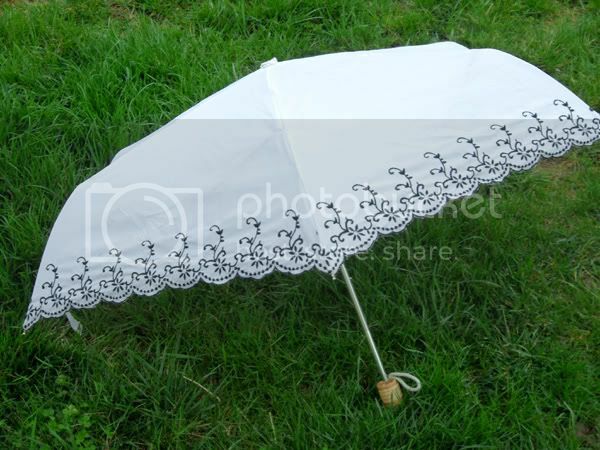 For only a little bit more than what you'd spend on your basic black umbrella at CVS you can get a cute, compact one that really adds to your look. I digress. Spike is amazing. He was complex and swaggery and had the sexiest accent. I love anything that has to do with him. I listened to his old band's music. I listened to techno remixes of his lines from the show. He is and always will be number one on my list (you know from "Friends" - the five celebrities you can sleep with without it being considered cheating). If I saw him right now, I would dissolve into a 12-year-old girl puddle of screaming tears. Anything that has to do with him I must own. One of these pieces will be mine, oh yes. Jodi Arnold has launched their online store, lots of pretty new pieces right at your fingertips! To celebrate, take 20% off and get free shipping with the code "JASPRING10" at checkout. This is one of the "Wild Things" collaboration pieces for Opening Ceremony. Isn't the texture to die for - faux fur somehow woven into rosettes! On sale now for just $66, I imagine it will sell out quick. What an unusual color for leopard print! This Karen Walker dress has almost an African / Ikat feel to it, don't you think? Perfect for the season! And, while originally $705, it's on sale for $212 at Milk! This clutch comes in basic black, brown or coral, but I'm really loving the magenta snake print! Big enough to be a day to night purse, you can buy at LOFT for $98. Who originated this rib cage print trend... was it Rodarte? No, I think there was a McQ BY MCQUEEN rib cage tee back in '08, but I can't find a picture of it. Buy this sweatshirt at Urban Outfitters for $108. A bit pricey for a sweatshirt, but you can't deny its cuteness! Does this work well? Who cares, it's a monkey blowing on your nails! Though it's only £6 or about $9 US dollars, so I imagine it will break after its 3rd us... Still adorably hilarious though! Buy from Totally Funky. H&M is holding an awesome contest on Facebook, where you upload a personal style pic and via votes and judging you could win a chance to be in a Lucky Magazine fashion spread (dies) and get a $500 shopping spree! Vote for me (or I will cry because I cannot express how badly I want the Lucky Mag photoshoot prize) and enter on Facebook! Wedding season is rapidly descending upon us! Besides never wearing white, the dress codes of wedding attire have gotten hazier and hazier as time has gone by. But don't fret, I have created this guide to help you look amazing. I decided to focus mostly on location, since that usually makes the most impact on what a person wears. Ahh, the beach wedding. This is usually "informal" or "casual" but how casual is too casual? Will your heels sink in the sank (answer: yes)? This is where you can break out your sparkly flat sandals or cute wedges. And while you can get away with loose jersey dresses, it still doesn't hurt to have some glitz - I'm particularly fond on the tank dress with the lamé skirt underneath! Buy at Nordstrom for just $120. But don't be afraid to dress to the theme, look for ikat, rafia, and island details to really create a great look. Don't forget a great wrap for the night ocean breezes! Garden weddings, or other outdoor wedding, are usually" informal", which technically falls between "casua" and "semi-formal." This usually means cocktail dresses, though you can still get away with a slightly more relaxed look, particularly if it's a daytime affair. This means flowy silks or tailored cotton. I can't help but love prints, particularly florals, for an outdoor wedding. If your style tends to be more minimal or edgy, go for a bright solid to look festive! As for shoes, strappy sandals with tall heels look great, but if you have trouble walking in grass you may want to consider a cute wedge. Cocktail weddings usually fall under "cocktail" or "semi-formal" attire and are the most common wedding had. They can be held in a huge variety of spaces, from art galleries to hotel ballrooms to the hottest restaurant! This is where you can really start amping up the glam factor, with sequins and lots of bling. You can also get a little edgier here, maybe pair your frock with some booties or hardware that would feel out of place outdoors. I love the Alexander Wang pyramid clutch for a mix of tough and luxe, but it's a pricey $490 at ShopBop. I have never been to a "formal" wedding, which is why I have beautiful long gowns wasting away in the back of my closet! These are always evening, black tie affairs with men in tuxedos and women in evening gowns. I imagine these are socialite weddings held at the Plaza, with towering centerpieces and seven course dinners. This is where you break out the satin clutches and pumps, and your most expensive jewelry. So there you have it, my thoughts and advice on how to style yourself the next wedding you find yourself attending! But don't be afraid to push the envelope... as long as you feel the bride would be OK with it. Remember, it's her day! I swear I saw Norma Kamali herself wearing there last fall during fashion week and they looked great! Buy at Norma Kamali in black or tortoise for $250. These Siwy cut off shorts have some tie dye detailing on the sides, a neat take on the tie dye trend! They look so cozy, and Siwy denim is always super soft. I totally want to hit up the beach now! Buy at South Moon Under for $168. I've been thinking about getting more studs to diversify my earring collection, but they always tend to be somewhat boring. But not these adorable cupcake ones by Viv & Ingrid! Buy at ShopTwigs for just $41. My so-called "friend" sent me this today, why are you torturing me?!?!? This cotton & linen blazer by Free People is a great lightweight piece for spring into summer! I really like the floral print, which has a almost a watercolor quality! Buy at JB & Me for $128. This Alice + Olivia dress looks so frothy sweet, like cotton candy or icing! I wish I could afford its $495 price tag at Bergdorf's! Oh wow, what a great way to rock a lingerie style look while looking sweet and feminine and not showing too much skin! This satin bed jacket would look great with a tank or jeans, over a bodycon cocktail dress or just lounging around the house! And on sale at Violetville's eBay store for $52! It seems that across the board, there has been a resurgence in DIY, as we are very much living in a world of 'Do it Yourself' everything; ranging from creating or updating or garments' silhouettes and decorative details to showcasing our own versions of runway looks, virtually styling with tools like Polyvore, tackling self-photography, and of course self-publishing via our blog platforms. We reign supreme in the DIY world on a daily basis, and I only see this trend gaining momentum. The roundup of this week's links is definitely an indication, directly and indirectly, of the incredibly creative, innovative, persevering, motivated folks that are part of the new DIY frontier, and of course, IFB! Denim Debutante - How Would You Change the Denim Industry? Fasshonaburu - Vyque & Alyssa review the "Project Runway" video game and give you a chance to win your own copy! For Those About to Shop - Designer NADA's Fashion future - how about a 3D film? Haute World - My real life encounters with Balmain and an exclusive tour inside the label's only boutique in the world. Shrimp Salad Circus - What does color do for your life? Skinnypurse - Skinny Cargo Pants: Love Them or Hate Them? The Working Wardrobe - Show this rainy season who's boss! The Coveted - Do you alter vintage? Tarina Tarantino is a jewelry designer who I haven't thought about in awhile, but looky she's launched a beauty line! I haven't tried any of the products, but the packaging is soooo pretty! You can buy lip gloss, brushes, primer and more at Sephora, most in the $20 to $35 range. COVET! It looks like mesh, but really it's laser cut silk/rayon! And can people stop using viscose to mean rayon, it gets me confused with viscous, thanks. Buy at Aloha Rag for the unattainable (for me anyway) price of $470. I think the cropped shape of this grey denim jacket gives a little bit of a buffer that makes it more pairable with denim bottoms for a non-country western denim on denim look! Buy at Revolve Clothing for $75. I wish I could afford this Foley + Corinna hobo, which has a sling-like quality that I love so much! I wonder if the strap is long enough to wear like a back pack!?! Buy at CUSP for $450. Tie dye, it's soo hot right now! I like this grey spiral version, which is unique but has more staying power than other incarnations. Buy at C & C California for $54. This Sorrelli necklace is kinda like a mix of a charm bracelet, pendant and bib necklace! It reminded me of twinkly, year-round tree lights and that made me happy so I'm sharing with you. Buy for $95 in three different colors. Hmm, I believe chambray is a light cotton fabric... does it always have to be denim blue colored? Because I've never seen it as anything else! Either or, this Dallin Chase blazer has the oh-so-popular denim look for spring, with luxe satin touches! Buy at ShopBop for $212. From far away the dot print on this reversible bikini looks a little metallic, and totally 80's! And if you get tired of the color, flip to the black side - or mix and match! Buy the halter top for $46 and matching bottoms for $42 at Swell. This zebra print has a lot more dimension by having black, white AND brown! Much more realistic, it's almost like there's one really there :P Buy at Tracy Reese for $145. What's up with me and animal prints lately, have I fallen into safari madness?? I like unusual cashmere sweaters, and tie dye is so chic right now! This Michael Kors sweater was originally a whooping $755, but now on sale at theOutnet.com for $265. All you have to say is "it's purple" and I'm sold, but this Gryphon tank is a particularly pretty piece! I love that it's not solid sequins, more like someone took a handful (or three) and just scattered them about the top. It's still got glitz, but it's much more wearable! Buy at Les Nouvelles for the sale price of $148. Ooo, I love this stripe print - almost zebra-esque, don't you think? This would be an amazing addition to anyone's spring wardrobe and it's on sale for just $97 at Bloomingdale's! This boxy shaped blouse with its mandarin collar would look great paired with a slim pair of black pants! Or be bold and tuck it into a fuchsia pink pencil skirt! Buy at La Garconne for the sale price of $186. I love the stars on this scarf - it gives some quirky sass to an otherwise classic piece, but manages to stay neutral! Buy at Otte for $105. This is what I wore for my birthday celebrations over the weekend. I could have accessorized more, though I know I started the night with a cute, grey denim jacket. But really, who cares cuz I look skinny, woo hooo! I was going for Taylor Momsen, think I succeeded? This silver chain clutch is impossibly cool, and more affordable than you would initially think - that doesn't mean it's within any of our price ranges though! Buy at Not Just a Label for $261. I was taken aback when going through the submissions this week – there were so many powerful, strong, opinionated pieces that I felt really taken aback. With overwhelming positivity or negativity, the fashion community is finding it’s voice – and making themselves heard! There were so, so many great links this week, it really was hard to narrow it down to 20. Check out the full listing of Links à la Mode here. 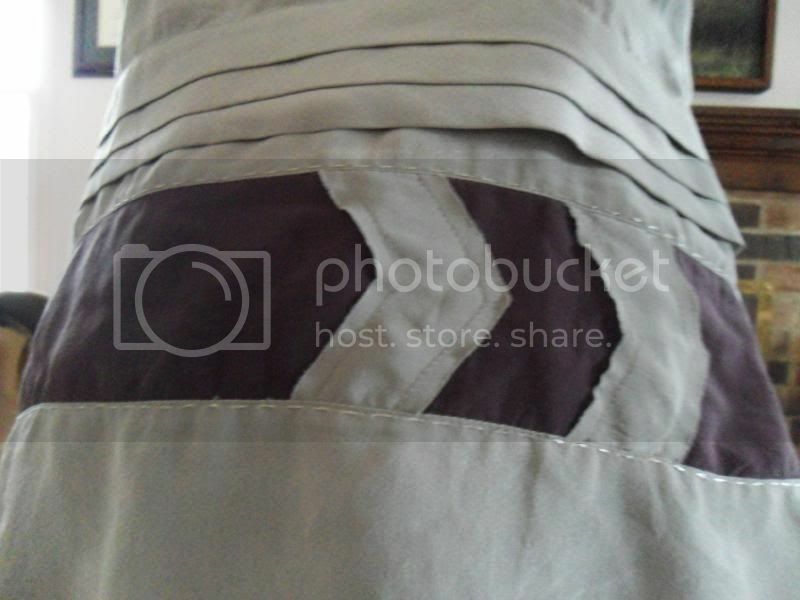 Bachman's Sparrow – DIY post on how to use bleach to revamp your “unloved” clothes! Pretty Shiny Sparkly: – It’s leather. It’s quilted. It’s a computer, for fashionistas. White Rabbit: – An interview with Irish fashion Designer Sinead Doyle and the inspiration behind her S/S 2010 collection. Nicole Richie is expanding her House of Harlow line, previously jewelry and accessories, to include shoes! No surprise, it's extremely boho with touches of art deco thrown in at times. The sandals and moccasins are a bit too earthy for me, but I'm really feeling those fish scale peep toes! You can buy at Singer 22 and prices range from $168 to $275 for the Misha boot - think it's named after Misha Barton? I need a famous designer friend to name things after me, dammit! 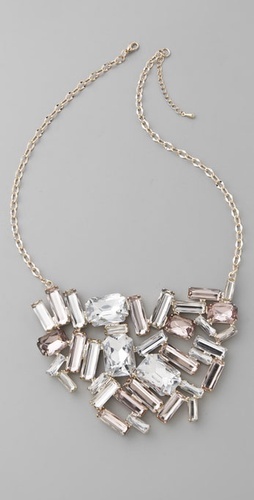 Ooo, you know this is one of my favorite styles of jewelry: clear, jeweled, asymmetrical bib! And it's only $88 at ShopBop, so impossibly tempting!